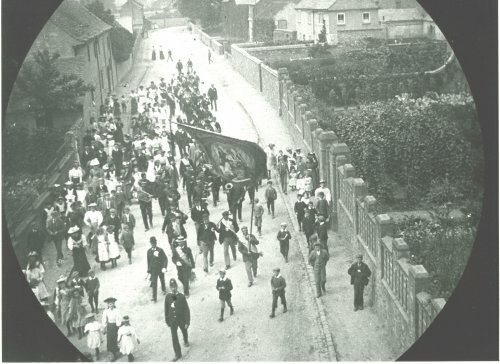 An early custom of the Oddfellows Society in Quorn was that of 'walking the village in procession' on August Bank Holiday, as shown c1906. Having lapsed for several years, this annual event was revived in 1895, when a service was held in the parish church on the previous Sunday for the Oddfellows and the Mutual Aid and Hand and Heart Benefit Societies. The custom of 'walking' the village finally ceased during the first World War. The parades were led by the Mountsorrel Band. After wards the Oddfellows repaired to the Bull's Head for a feast and then sports and a tug-of-war took place. The original to this photograph is a glass slide. The annotation on the slide indicates that it is Soar Road, but it is actually Meynell Road (which leads on from Soar Road), possibly photographed from an upstairs room in Santa Maria Lodge. In the distance, the road appears to be blocked. In fact, the road bears to the right and takes the old route of Barrow Road. This old road still exists but is blocked some way down by the modern day A6 bypass.